Get a feel of the islands while enjoying grilled turkey burgers topped with a fiery pineapple salsa. 1. For the Tropical Salsa, mix all ingredients in small bowl. Set aside. 2. Mix ground turkey, pineapple, green onion, parsley and Seasoning in large bowl. 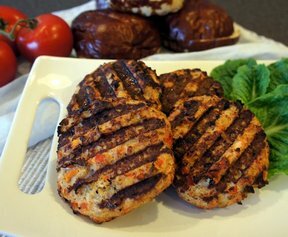 Shape into 4 patties. 3. Grill burgers over medium heat or cook in nonstick skillet 4 to 6 minutes per side or until cooked through (internal temperature of 165° F). Serve on rolls topped with lettuce and Tropical Salsa.